Welcome to the Hollywood of Morocco, the province Ouarzazate (pronounced as Wah Za Zat). A small town that sits at the edge of the High Atlas Mountains and is a true mecca for film enthusiasts the world over and home to the Atlas Film Studio. Famous blockbuster movies, such as Prince of Persia: Sands of Time (2010), Kingdom of Heaven (2005), Gladiator (2000), The Mummy (1999), Kundun (1997), The Last Temptation of Christ (1988), James Bond’s The Living Daylights (1987), Legionnaire, and older films such as Lawrence of Arabia (1962) were all filmed in Ouarzazate (including the Kasbah in Ait Benhaddou where scenes from the Jewel of the Nile was filmed). On the road to Ouarzazate! Most people have never heard of this beautiful desert city, as they sit watching a scene from the Prince of Persia: Sands of Times in their home town movie theater. Today, Ouarzazate (which means “door to the desert”), is one Morocco’s fastest growing cities. For the most adventuresome, the best way to get to Ouarzazate is via a car from Marrakech. The route is roughly a 4 hrs drive on a two-lane highway that is known as the Tizi-n-Tichka Pass Road. I have found the road to be spectacular at every turn through alpine areas and then through arid, rugged mountains along both sides with dots of Berber villages coming into view. As you descend into the sun-kissed desert highland, you will first get to the turn off leading into Ait Benhaddou. Ait Benhaddou is most notable for its kasbah, Kasbah Taourirt. A UNESCO World Heritage site that is on the southern corridor of the desert oasis, strikes up the rich architectural history of southern Morocco with buildings fortified out of mud and straw and enclosed by high walls on either side. The thought that comes to mind is that of a giant castle built out of nowhere and surrounded by a landscape that has a river running through it. 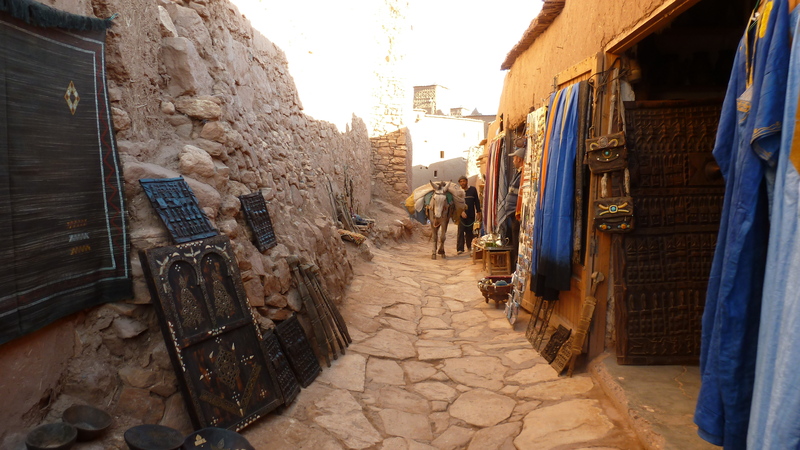 Ait Benhaddou is worth the stop for a walk-around to view the town and its historical Kasbah.